Pipal was written by Robin Wood . Pipal is a great analytical program that takes a password dump and looks for patterns, including password lengths and complexities. Pipal is a password analyser tool which is written in ruby . To analyze password , you need a text file which contain passwords . Here in my case i used a text file which have more than 2 million passwords . To make it simple i save this text file in pentest/passwords/pipal directory . After saving your password file in pipal directory , check once again it display on the konsole or not by using ls command . 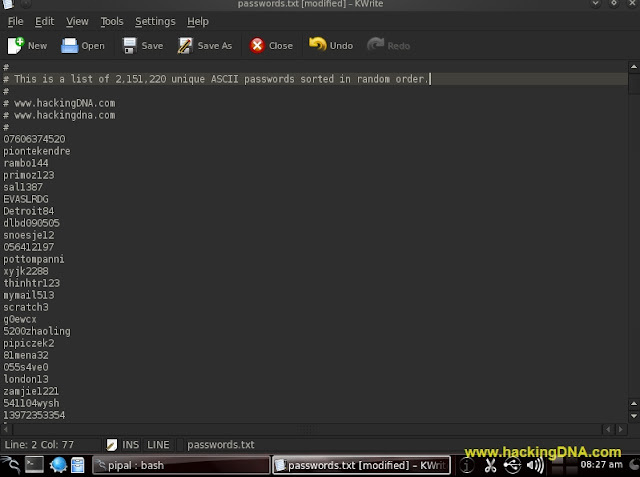 See the below image , its clearly shown there - when we use ls command it display my passwords.txt file on the konsole . Steps are same as above but here instead of passwords.txt file i have used hackingDNA file . THIS IS HOW WE CAN USE THIS TOOL TO ANALYZE THE PASSWORDS. ITS A GOOD TOOL FOR ANALYZING PURPOSES . MORE EXAMPLE WILL BE UPLOADED SOON .